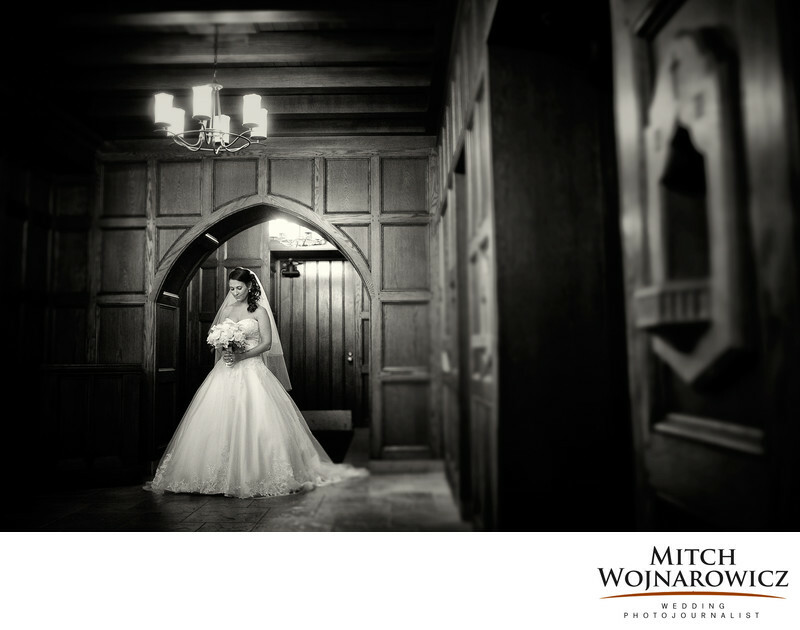 Schenectady wedding photographer..Working as a Schenectady wedding photographer, in the manner of a documentary wedding photographer and wedding photojournalist, one of my favorite things to do is to keep my eyes open during times of transition. Of course I'll make a great image of the bride arriving at the church. Of course I'll make a great image of the bride and her father walking up the aisle to her waiting groom. But in between those moments isn't a time for me to sit and relax. In between those moments is a time for me to look for the quiet images, the unusual images, the emotional moments...Once the bride was brought into the church for her new years eve wedding ceremony, she had a few moments alone before her father arrived to walk her up the aisle. Standing in the back of the church she reflected on her Schenectady wedding about to take place. I was a distance away and did not disrupt the moment but am happy that I was able to capture a wonderful, reflective, personal moment for her. Hopefully this photograph will remind her of all she was thinking before she walked up the aisle to be married...There are so many wonderful moments to be captured during a wedding and day that fall outside of a checklist. Look for a photographer who can take those traditional photos, the expected photos, but look also for photographer who can read in between the lines and produce quiet reflective images such as this or big and bold images from moments that you never saw. I look forward to finding the small intimate quiet moments at every wedding such as this one. A photograph such as this is one that you will look at years from now and it will bring back so many memories from your Schenectady wedding day...Get in touch with me today and we can talk about your wedding wherever it is taking place.....Keywords: schenectady (12).